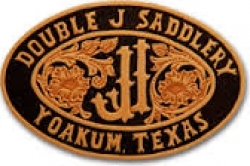 Double J Saddlery has been in operation since 1991. Our family represents 3 generations of handmade excellence in Yoakum, Texas. We build custom saddles and some great looking tack, belts, and personal accessories in our factory in Yoakum, Texas. We are blessed to be associated with many skilled craftsmen and women. Their strong work ethic, and a shared commitment to quality, enable us to produce a superior product. We use only the best raw materials available in everything we build. We even build our saddle trees in our factory. We've developed a state of the art saddle tree manufacturing system. Each saddle tree is individually made to rigid specifications for quality and fit. We use Herman Oak® skirting leather, and custom designed stainless steel hardware. Our company is founded on the belief that only by using quality materials can we produce a quality product. One of our strongest assets is that we use what we make. We ride virtually every day, and compete on a national level in our chosen discipline of team roping. In addition, our people are involved in barrel racing, cutting, and western pleasure, and we are associated with people who make a living working cattle on horseback here in South Texas. As you can see, product research and development is a very personal commitment. We also do not underestimate the value of looking good when we are competing. Check with us often for new and exciting products for you and your horse that, offering the highest level of durability and beauty available today.